The cast and crew of Henglaar, M.D. would like to thank you for your support over the seven years we’ve been in production. You have been great to us, helping us extend the legacy of Hidden Frontier’s groundbreaking video and audio series. As you are likely now aware, Paramount and CBS have released “Fan Film Guidelines” for the Star Trek franchise. These guidelines inject a great deal of uncertainty into our operations. This is both in terms of our ongoing audio productions (Henglaar, M.D. ; Diplomatic Relations, and Equinox) and our video legacy (Hidden Frontier, Odyssey, Helena Chronicles, and Federation One). We are still investigating the impact of these guidelines, but we believe that 1) they likely apply to audio productions and 2) they would render a series like Henglaar, M.D. untenable going forward. If Paramount and CBS choose to apply these guidelines retroactively, it is entirely possible that the series that you have come to love over the years could be pulled from the Internet entirely. We do not hold any ill will towards Paramount or CBS. We have always known that we have been playing in their sandbox and they could kick us out at any time. There was an unspoken “gentleman’s agreement” between fan content producers and Paramount/CBS – we agree to not make money on these ventures (we’ve always been “amateur” and self-funded) and they overlook the fact that we’re using their intellectual property for our own “fair use”. Unfortunately, that agreement has now been broken by a producer in spectacular fashion and we are now dealing with the catastrophic consequences of those actions. We will do our best to keep the existing series online. 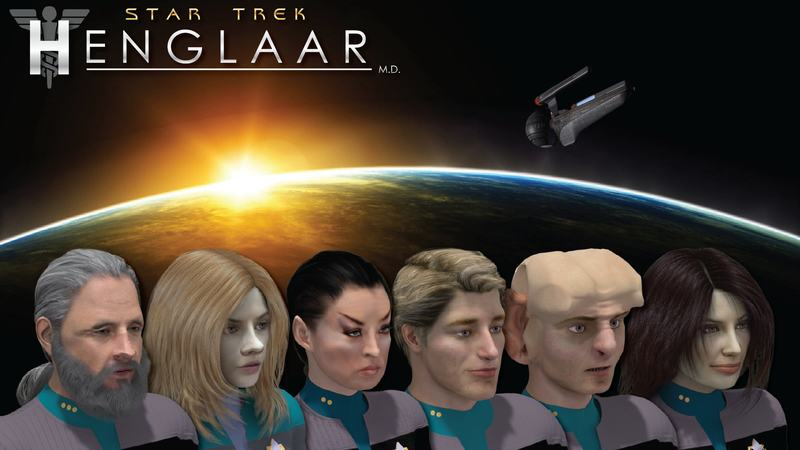 However, until it becomes clear that we will not run afoul of Paramount and CBS, production of Henglaar, M.D. is indefinitely suspended. Hopefully, you will find that Audio productions are immune to most of this (as you have no sets or props, etc) and can keep on trucking. In any case, you have my support. I’m writing a Star Trek series. I’d secretly hoped someday to hear it on audio. Even if it never happens now, I’m still going to finish what I started. I believe in the dream that is Star Trek, and I refuse to let a corporation crush that in the name of whatever they want to call it. Absolute rubbish what CBS is doing, the basically have said Money over Fans…unfortuantely Fans is where the Money comes from. I see some ugly things happening in the future of Trek, and it should not be blamed on a producer making a quality fan film funded by the fans. The finger should be pointed at CBS and their Pay Per View money grubbing hands. Those guidelines are very specifically about fan films. There is nothing in them that discusses fan audio dramas at all. As much as the guidelines are in place to prevent Axanar from moving forward, I have to agree that they don’t want the All Access TREK show to have to compete with high-budget fan productions that look just as good and maybe also have some celebrity guest stars and are available for free. Lawyers put those guidelines together to address fan films, period. If they were to also apply to audio dramas, they would have said so. Somehow, though, I can’t see CBS/Paramount suddenly announcing that they’re going into the audio drama field. Really, you’re safe in that regard. I hope you’re right. Indications are that you might be right. But we’re acting out of an abundance of caution. We really do hope we can get back to our passion, telling these stories. when there are the episodes with German subtitles? Good question. I believe they are somewhere on YouTube, but I don’t have a list unfortunately (it went away when we lost the old forums).